2010 Introduced Isaac HD Multi-Function Leak Tester with Color Touch Screen. 2005 Introduced Isaac Multi-Function Leak Tester. 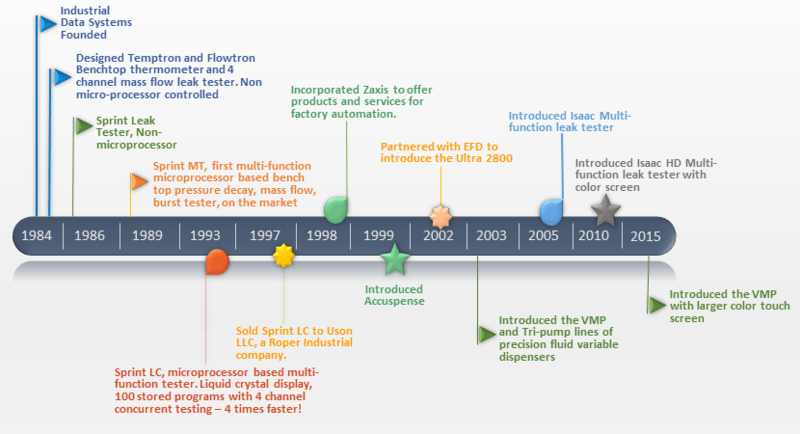 2003 Introduced VMP and Tri-Pump lines of precision fluid variable dispensers. 1999 Introduced Acuspense line of products. 1998 Incorporated Zaxis to offer products and services for factory automation. 1997 Sold Sprint LC to Uson LLC, a Roper Industrial company. 1993 Sprint LC. Microprocessor based multi function tester. Liquid crystal display, 100 stored programs with 4 channel concurrent testing – 4 times faster! 1989 Sprint MT, first multifunction micro processor based bench top pressure decay, mass flow, burst tester on the market. 1984 designed Temptron and Flowtron Benchtop thermometer and 4 channel mass flow leak tester. Non micro-processor controlled.